Theodore Roosevelt Lake is popular for boating, fishing and camping rather than hiking, partly as the majority is bordered by gently undulating desert hills and dry washes, without any features of specific interest. 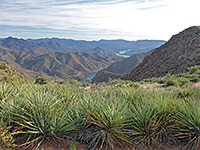 Only along the western half of the southern shoreline is the scenery more dramatic, as here the land rises steeply to the southernmost peaks of the Mazatzal Mountains, most contained within Three Bar State Wildlife Area, part of the Tonto National Forest. Several rough tracks climb into the hills, as does one trail, the only maintained hiking route near the lake; this is the cross-state Arizona Trail, one component of which is also known as the Vineyard Trail. From a start point just north of Theodore Roosevelt Dam, the path gains over 1,000 feet of elevation in little more than one mile, then is fairly level as it traverses westwards across ridges and minor summits, reaching an alternative trailhead (Mills Ridge) after 5.8 miles, from where the Arizona Trail continues into the Four Peaks Wilderness. Just the first two or three miles of the Vineyard Trail make a fine half day hike, affording a variety of views, and crossing slopes covered with many species of Sonoran Desert plants. 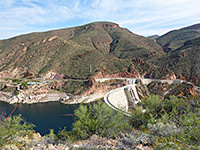 The initial section overlooks the dam and the southern section of Roosevelt Lake, the next stretch crosses a ridge to a grand panorama over the northern reaches of the reservoir, then the path curves back south, high above Apache Lake. Although starting right beside highway 188, the trailhead is not prominently marked and the route is not often hiked. The trail and an adjacent canyon are named after a vineyard which was once established nearby. 24 views along the Vineyard Trail; gallery, slideshow. The main (eastern) trailhead for the Vineyard hike is at a wide pull-out on the east side of Highway 188 just north of Theodore Roosevelt Dam, a good location from which to photograph the highway bridge across the lake. A small Arizona Trail notice at the south end of the parking lot points towards the start of the path, on the opposite side of the highway, right next to a road sign announcing the Hwy 88 junction. The remote western trailhead at Mills Ridge is 4.6 miles along FR 429, an unpaved track that forks off Hwy 188 two miles north, and generally requires at least an HCV. An aged notice displays the name of the Vineyard Trail, just after the start. The path curves in and out of a little ravine and rises to a small ridge, where another notice marks the site of Camp O'Rourke, the temporary home of up to 400 workers constructing Theodore Roosevelt Dam between 1906 and 1911 - 130 feet east are the remains of a stone dwelling and several foundations. 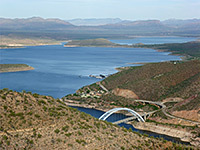 The ridge gives good views of the dam, the highway bridge and the end of the unpaved section of the Apache Trail. Past here, the path winds through several minor switchbacks as it climbs above the ravine, returning south to a second, higher vantage point above the dam; next is a longer, steeper section, heading northwards up to a saddle, beyond which all of the northern section of the lake comes properly into view for the first time. The slightly higher elevation results in subtle changes in the plant life; species like phacelia and blue dicks are seen here for the first time, while lower down the most visible wildflowers are liveforever and globemallow. The trail is less steep for a while, even descending briefly, as it moves across the northern slopes of 3,096 foot Inspiration Point, then ascends steeply to a ridge on the west side of this peak, an often very windy location. Loose stones cover parts of the path up to the ridge, somewhat of a problem when descending. The route continues west up a broad ridge projecting from the next, higher peak, 3,458 foot Vineyard Mountain. A disused radio tower is visible a short distance off-trail to the south, as the path stays on the north side of the crest, passing through grassier, bushier surroundings where plants include sotol, ocotillo and banana yucca. Views to the north are now very extensive, over the adjacent valley of Chuckwalla Canyon and the lower end of the Tonto Creek basin. 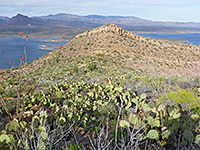 After reaching a minor highpoint, another ridge extending from Vineyard Mountain, the path descends slightly to the upper end of a ravine, where Apache Lake is first sighted, 1,200 feet below, with the sinuous course of the Apache Trail on the far side. 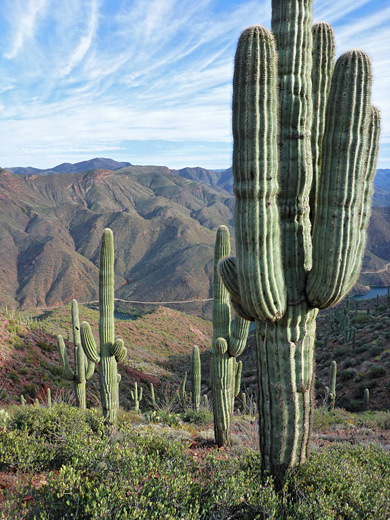 The sheltered surroundings allow many tall saguaro cacti to flourish; before this the only abundant large cacti are ferocactus wislizeni, the Arizona barrel cactus. The bright green cacti and other vegetation contrast with the reddish color of the exposed rocks, and of the usually deep blue sky above. 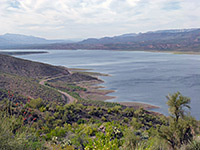 This location is a good target for a short hike; beyond, the next 1.5 miles are out of sight of Apache Lake, traversing rather barren land just north of two small summits, before the path descends 350 feet around the upper end of another ravine, and has more, briefer views of the Salt River valley, now quite distant. Soon after (4 miles from the trailhead), the trail crosses a spur track (FR 336) that links with FR 429, and continues on the far side; it steadily climbs along the crest of a narrow ridge to the western trailhead.